The BL 15 x 56 BR Binocular from Minox is designed and crafted to deliver maximum comfort and secure handling. Ergonomic design and rubber armoring make this binocular tough and durable with a secure hold. The housing is constructed from rugged polycarbonate, and it's completely covered in noise and shock-dampening rubber armoring. It has a metal focusing wheel with fine rubber ribs that allow the user to feel the setting for infinite focus, thereby freeing him to keeps his eyes on the viewing target and not on the focusing wheel. 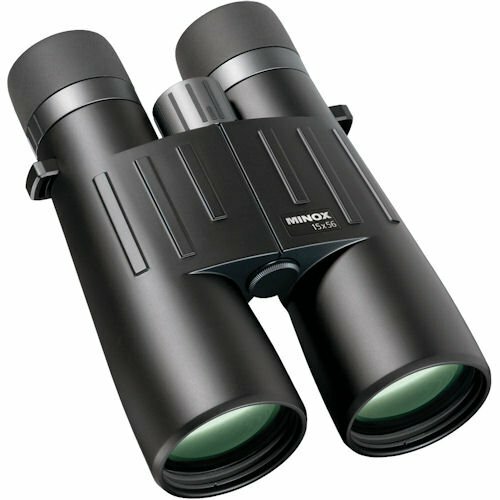 Besides being comfortable to hold and use for extended viewing periods, this binocular boasts phase-corrected roof prisms, highly-refined lenses with multi-layer coatings, and a pair of very efficient 56 mm objectives. These optical considerations result in brilliant pin-sharp imagery with accurate color rendition, even under difficult and dynamic lighting conditions. The BL BR 15 x 56 Binocular offers eyeglass-friendly eye relief, retractable rubber eyecups and a pleasingly wide Apparent Angle of View of over 61°. Internal fogging is eliminated by nitrogen purging - the entire system is sealed for waterproof performance to a depth of 5 m / 16.5'.